As has been well publicized, around the world many frog species are in decline and are going extinct at an alarming rate (conservatively, 120 species have gone extinct since the 1980's). In Arizona, this is also the unfortunate trend. It is thought by many that frogs are more sensitive to climate change, and aren't able to relocate and adapt as quickly as some animals. Weakened and decreased populations are then much more susceptible to diseases. Given all of the pessimism around the future of frogs, it was nice to see what appeared to be a native Lowland Leopard Frog, Rana yavapaiensis, at Ayer Lake at Boyce Thompson Arboretum. Arizona is currently home to 15 frog species, including treefrogs and true frogs. 3 of those species are non-natives that were introduced to Arizona, and have established breeding populations. Unfortunately, two of those introduced species present a real threat to native frogs, including thee leopard frogs. The eastern USA native American Bullfrog is the largest threat. 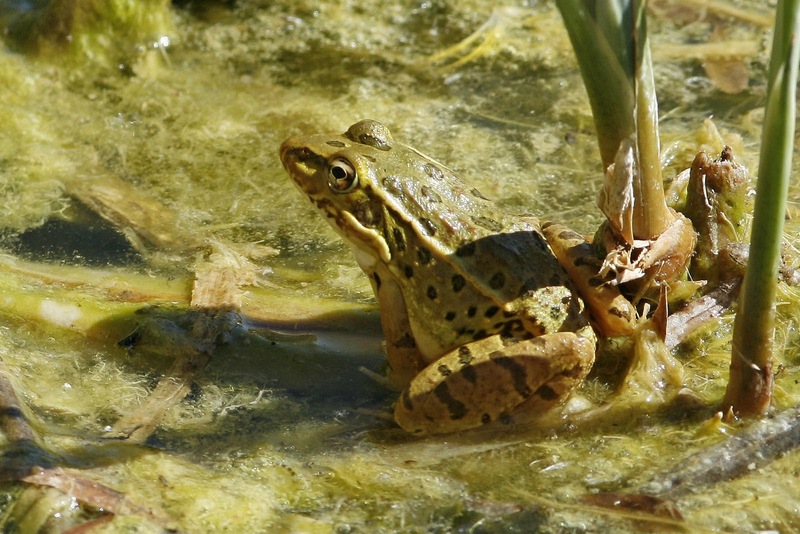 Being a large frog that eats almost anything aquatic, leopard frogs are often on its dinner plate. The introduced Rio Grande Leopard Frog also competes in the same habitats, and may be pushing the native Lowland Leopard Frog out. So enjoy our frogs while you can. Lets hope that conservation efforts can help mitigate the affects of disease, warming, and non-native introductions.